The 59-year-old actor will reprise his part of Ra's al Ghul for the forthcoming movie, despite his character being killed off in 2005's 'Batman Begins', with the news revealed in Warner Bros' production notes for his latest film 'Wrath of the Titans'. There can be no doubt that the apostles believed what they saw. Paul believed what was reported to him. And the facts could be checked out by anyone of the day with over 500 people that saw Jesus of Nazareth alive after had been executed by crucifixion. You can choose not to believe the accounts of these honest, upstanding men of the first century, but you you would be hard-pressed to say that they didn't believe what they reported to us. After all, these same men and women, nearly to the person, all died saying they believed when they could have easily recanted as they were tortured and martyred for their beliefs. I am trying here to prevent anyone saying the really foolish thing that people often say about Him: "I'm ready to accept Jesus as a great moral teacher, but I don't accept His claim to be God." That is the one thing we must not say. A man who was merely a man and said the sort of things Jesus said would not be a great moral teacher. He would either be a lunatic - on the level with a man who says he is a poached egg - or he would be the devil of hell. You must take your choice. Either this man was, and is, the Son of God: or else a madman or something worse. contact@myoceansidechurch.com and we'll get you a book. I love that quote by C.S. Lewis. 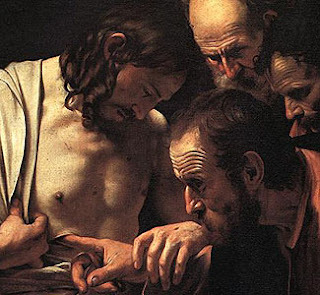 And as for the picture of Thomas putting his fingers in Jesus side... Well, I would have been like, whoa, not that deep you're going puncture my lung. C.S. Lewis rocks it for sure! I thought that pic was so powerful for examining Christ deeply! He will let you go as deep as you need to. Still made me feel uncomfortable. Thnx for commenting. I always assumed He was guiding Thomas' hand TO the wound when viewing photos such as this but, after Ivey's comment, maybe He was trying to keep him from pulling a "Little Jack Horner." Seriously, thank you for sharing again the miracle of that 1st Easter morning. I don't think I've ever read that quote but C.S. Lewis surley gets to the heart of the matter.